Released in celebration of the Britten anniversary year, Richard Farnes, the Music Director of Opera North who led their critically acclaimed production of The Turn of the Screw in 2010, conducts an all-English cast in Britten’s most ingeniously crafted opera, including Andrew Kennedy, Sally Matthews, and 11-year old Michael Clayton-Jolly in the role of Miles. Originally scheduled to be conducted by Sir Colin Davis, Richard Farnes was the natural replacement, himself having been mentored by the late conductor. In 1932, the 18-year-old Britten heard on the radio ‘a wonderful, impressive but terribly eerie and scary play The Turn of the Screw by Henry James.’ Britten’s version of the ghost story, premiered in 1954, is a chamber opera in a prologue and two acts. The opera tells the story of a Governess and a housekeeper Mrs Grose who vow to protect two children, Miles and Flora from the strange happenings that occur in the grounds of their English country house. On 1 June 1932, the 18-year-old Benjamin Britten sat listening to the radio. He noted in his diary that he heard ‘Saint-Saëns Carnval des Animaux [sic]—and a wonderful, impressive but terribly eerie and scary play The Turn of the Screw by Henry James’. Britten may not have been able to predict the future hold that James’ 1898 ghost story would have on him, but E J King Bull’s dramatisation clearly left a mark. In the early 1950s, now an established composer with commissions pouring in, Britten began to think about James’ novella once more. Myfanwy Piper, the wife of the artist and designer John Piper, mentioned the operatic potential of the story to the composer’s partner Peter Pears. Britten was intrigued, but work on Billy Budd (1951) and the coronation opera commission Gloriana (1953) were understandably dominating his thoughts. 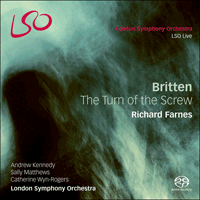 Once those projects had been dispatched—the first successfully, the second meeting with a somewhat muted response—Britten was free to focus on The Turn of the Screw. Having promised but failed to deliver the opera for an original premiere at the Venice Biennale in 1953, the pressure was on. Thankfully, collaborating with Myfanwy Piper provided an immediate fit. Piper was sadly unable to decamp to Aldeburgh to work directly with Britten due to her family commitments—Britten once remarked that ‘I don’t understand really how you managed to fit it all in’—yet the pair collaborated well at a distance, ironing out any hitches via letters and phone calls. They formed a mutually respectful partnership and worked quickly towards the postponed first performance on 14 September 1954. James’ story about the loss of innocence and Piper’s often psychosexual poetic response suited Britten perfectly. The ghost story structure prompted his ingenious theme and variation structure, described by a rising and falling tonal scheme (not unlike a turning screw). But the power of the opera is based not only on the inventiveness of its construction but also its nascent theatricality. In Quint and Miles, Flora and Miss Jessel, Britten and Piper created some of the most beguiling yet chilling characters in all opera. Le 1er juin 1932, Benjamin Britten, âgé de dix-huit ans, écouta la radio. Dans son journal, il écrivit avoir entendu «le Carnval des Animaux [sic] de Saint-Saëns—et une pièce magnifique, impressionnante mais terriblement sinistre et effrayante, Le Tour d’écrou d’Henry James». Britten ne pouvait certainement pas imaginer l’emprise qu’exercerait plus tard sur lui la nouvelle fantastique de James (1898), mais l’adaptation dramatique d’E. J. King Bull laissa manifestement son empreinte. Au début des années 1950, devenu un compositeur reconnu recevant de nombreuses commandes, Britten commença à repenser à la nouvelle de James. Myfanwy Piper, la femme de l’artiste et décorateur John Piper, parla du potentiel opératique de l’histoire au compagnon du compositeur, Peter Pears. Britten se montra intéressé, mais son travail sur Billy Budd (1951) et sur la commande de l’opéra de couronnement Gloriana (1953) occupaient de manière compréhensible ses pensées. Une fois qu’il en eut fini avec ces projets—le premier créé avec succès, le second recevant un accueil plus mesuré—Britten se trouva libre de se consacrer au Tour d’écrou. Comme il avait promis—sans y parvenir—de livrer l’ouvrage pour une création prévue à l’origine lors de la Biennale de Venise en 1953, il était sous pression. Par chance, la collaboration avec Myfanwy Piper fonctionna immédiatement à merveille. Malheureusement, les obligations familiales de Piper l’empêchaient de filer à Aldeburgh pour travailler directement avec Britten—lequel fit un jour cette remarque: «Je n’arrive pas à comprendre comment vous réussissez à tout faire»; mais le duo trouva un mode opératoire efficace à distance, aplanissant toutes les difficultés par lettre ou par téléphone. Leur collaboration reposait sur un respect mutuel et ils avancèrent rapidement vers la première représentation, reportée au 14 septembre 1954. La nouvelle de James sur la perte de l’innocence, et la réponse souvent psychosexuelle qu’en fit Piper seyaient parfaitement à Britten. La structure du récit fantastique détermina l’ingénieuse construction en thème et variations imaginée par Britten, décrite par un schéma tonal ascendant et descendant (un peu à la manière d’un écrou que l’on tourne). Mais le pouvoir de cet opéra repose non seulement sur sa construction mais aussi sur sa théâtralité naissante. Avec Quint et Miles, avec Flora et Miss Jessel, Britten et Piper ont créé quelques-uns des personnages les plus séduisants et pourtant les plus effrayants de l’histoire de l’opéra. Am 1. Juni 1932 hörte der 18-jährige Benjamin Britten Radio. Er notierte in seinem Tagebuch, er habe „Saint-Saëns Carnval des Animaux“ (sic! )—und ein wunderbares, beeindruckendes, wenn auch fürchterlich unheimliches und beängstigendes Stück, The Turn of the Screw von Henry James“ gehört. Britten konnte da wohl noch nicht die Faszination voraussehen, die James’ Geistergeschichte von 1898 auf ihn einmal ausüben sollte. E. J. King Bulls Inszenierung hinterließ bei ihm jedoch offensichtlich ihre Spuren. In den frühen 1950er Jahren begann Britten, nunmehr ein etablierter Komponist mit laufenden Aufträgen, erneut über James’ Novelle nachzudenken. Myfanwy Piper (Frau des Künstlers und Designers John Piper) erwähnte Peter Pears (Partner des Komponisten) gegenüber, welches Potential für eine Oper in dieser Geschichte steckt. Britten fand an dem Gedanken Gefallen, doch die Arbeit an Billy Budd (1951) und Gloriana (1953, Auftragsoper zur Krönung Elisabeths II.) nahmen verständlicherweise seine Aufmerksamkeit in Anspruch. Nach Abschluss dieser Projekte (das erste erfolgreich, das zweite fand eher lauwarmen Zuspruch) konnte sich Britten unbeschränkt auf The Turn of the Screw konzentrieren. Britten hielt sein anfängliches Versprechen, die Oper für eine Uraufführung bei der Biennale di Venezia 1953 zu liefern, nicht und geriet in Zeitnot. Zum Glück lief die Zusammenarbeit mit Myfawny Piper sofort gut an. Leider konnte Piper aufgrund ihrer Familienverpflichtungen nicht nach Aldeburgh ziehen, um mit Britten vor Ort zusammenzuarbeiten (Britten sagte einmal: „Ich verstehe nicht richtig, wie du alles unter einen Hut bekommst.“).Trotz der Ferne arbeitete das Paar aber gut zusammen und löste alle Schwierigkeiten in Briefen und Telefongesprächen. Britten und Piper erwiesen der Arbeit des anderen Respekt und arbeiteten schnell, damit die verschobene Uraufführung am 14. September 1954 stattfinden konnte. James’ Geschichte über den Verlust der Unschuld und Pipers häufig psychosexuelle poetische Reaktion darauf passten Britten perfekt. Ausgehend von der Struktur der Geistergeschichte schuf Britten sein raffiniertes Thema und Variationskonzept, das einer Anordnung aus aufsteigenden und fallenden Tonarten folgt. Aber die Oper beeindruckt nicht nur so stark aufgrund des Einfallsreichtums ihrer Konstruktion, sondern auch durch ihre inhärente Bühnenwirksamkeit. Mit Quint und Miles, Flora und Miss Jessel schufen Britten und Piper ein paar der verführerischsten und zugleich unheimlichsten Rollen im gesamten Opernrepertoire.